Easter. Bunnies. Chocolate. Somehow in the very weird evolution of all things holiday, these three things came together. Ok, so the Easter Bunny delivers countless chocolate eggs to little boys and girls, but what’s a rabbit doing with eggs? Where’d he get them? I’ve spent the past several years studying and then working at a university campus riddled with rabbits – they were everywhere, charming everyone except the gardeners, who finally won the battle to get rid of all the bunnies by shipping them off to Texas to a “rabbit haven” or some such thing, where they’d be safe and all the foaming-at-the-mouth animal rights people could reassure themselves that the rabbit problem had been humanely dealt with. All the animal rights people who have clearly never been to Texas. Where, yeah. I’m sure all the bunnies are leading happy, hopping lives. I had rabbit stew once. It was pretty yummy. Anyway, rabbits. I’ve been around them a lot. I’ve never seen any of them lay eggs, or steal eggs, or do much of anything at all except eat, poop, and make more rabbits. 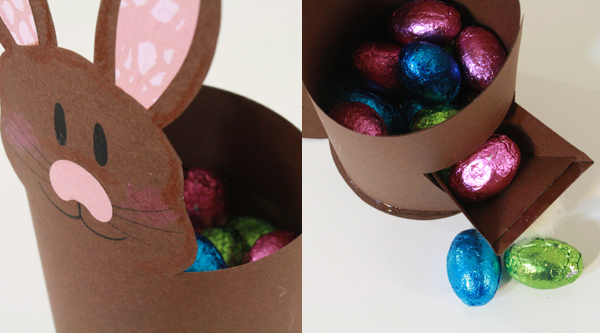 So for me, the logical conclusion when it comes to the Easter bunny is that he’s pooping out chocolate eggs. Rabbits poop constantly, and their poo looks like little brown pellets, and since the Easter bunny is magic, he’s clearly got a digestive tract that converts his intake into delicious chocolate, which he then excretes throughout happy homes everywhere on Easter morning. Also helps explain him being able to carry so many chocolate eggs around at once – if he just keeps eating, eggs keep appearing! Never mind leaving milk and cookies out for Santa, we ought to be doing it for the Easter bunny to help him along. 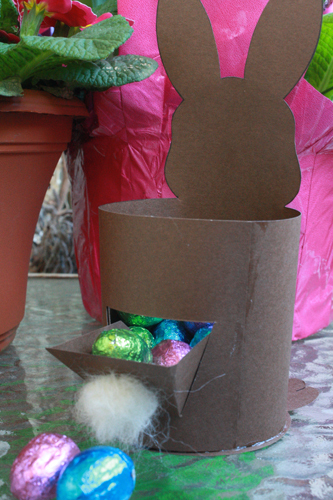 You all know how I like to illustrate these flights of fancy, so this week I’ll be showing you how to make a little pooping bunny basket to hold this year’s Easter treats. Follow along and enjoy the magic! 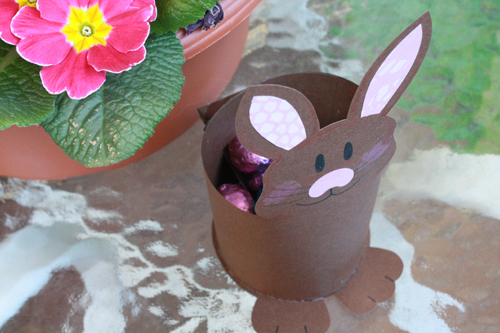 1) Print out the pooping bunny basket template onto your coloured cardstock. 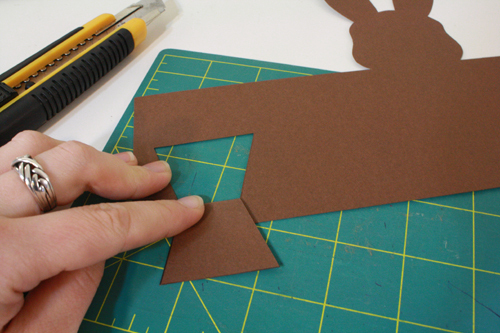 2) Start by cutting out the entire bunny shape. The long straight lines to either side of the bunny’s head will disappear before the edge of the paper, given margins and such printer operation procedures work, but just keep cutting all the way to the edge of the paper, regardless of where those lines stop. You want as much length there as possible. 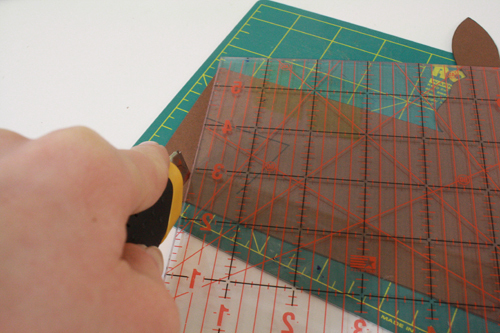 3) Using a straight edge and an exacto knife (with something underneath to keep you from cutting into your work surface! 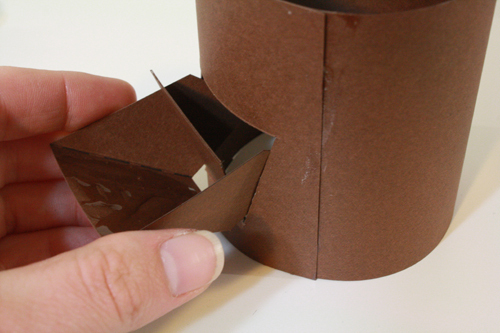 ), cut along the lines on either side of the rabbit piece that look like a slanted 3-sided box. 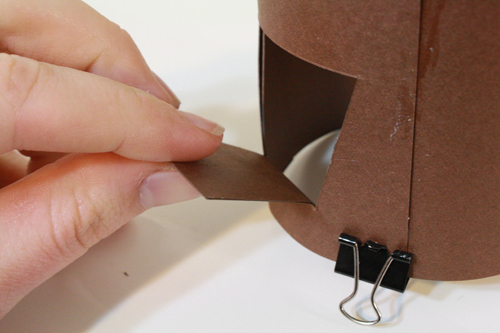 You should have a flap with 3 sides cut out and the other still attached. 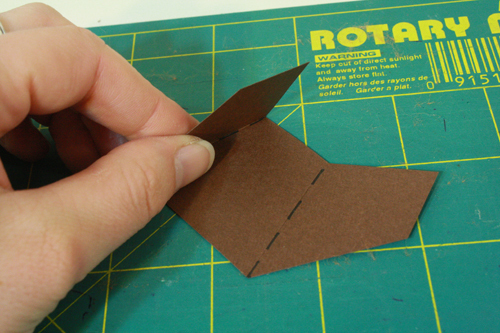 4) Turn the rabbit over and fold the flaps down, creasing their bottom edges. 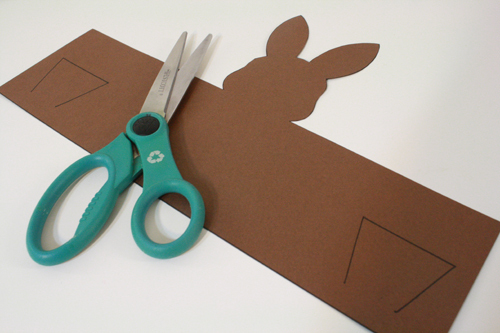 5) Trim a tiny narrow bit of paper off the sides of each flap piece with your scissors. 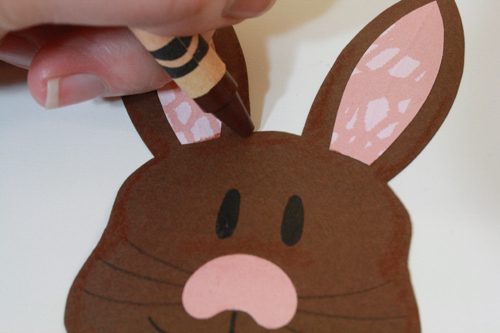 6) I of course didn’t think of this until later, when everything was 3-dimensional and thus it was a bit trickier to do, but now is a good time to add any facial features and colouring you want to your rabbit, using markers, crayons, glued paper, etc. 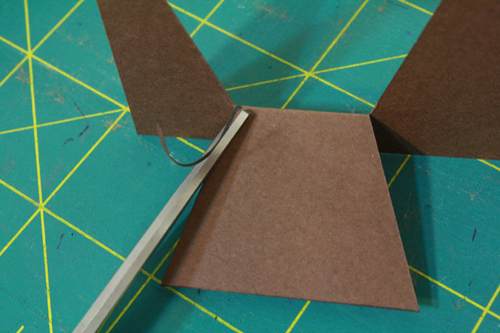 7) Now, bring either end of the bunny piece circling back behind the head, and match up the two flaps exactly. 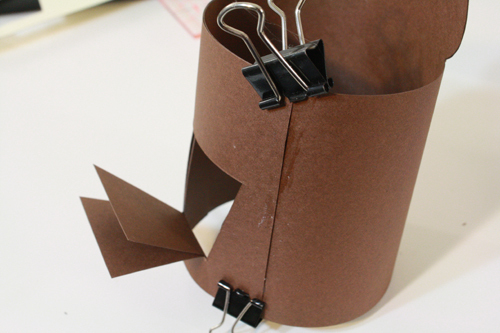 Glue the overlapping paper together, and hold it in place with binder clips while the glue sets. 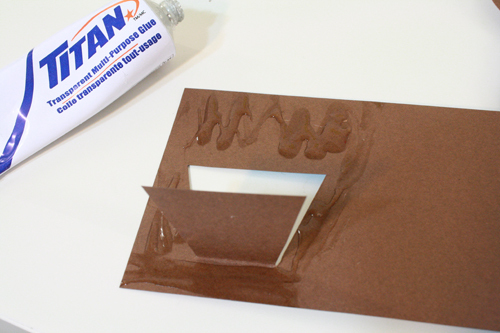 8) Glue the two flaps together. 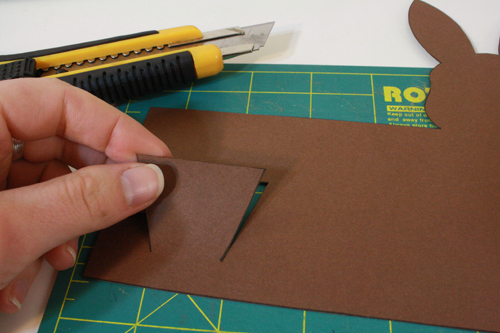 Once glued, you might also want to fold the now double-layered flap back and forth a couple of times, inward and outward, really giving the bottom of the flap a good, flexible crease. 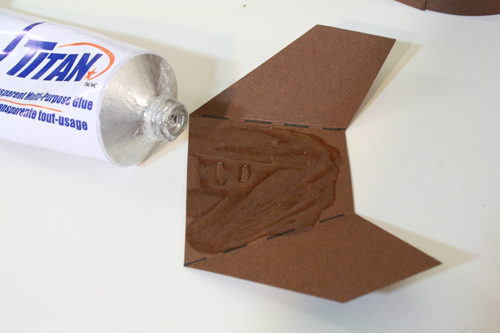 9) Cut out the other two template pieces – the feet and the oddly angled piece. 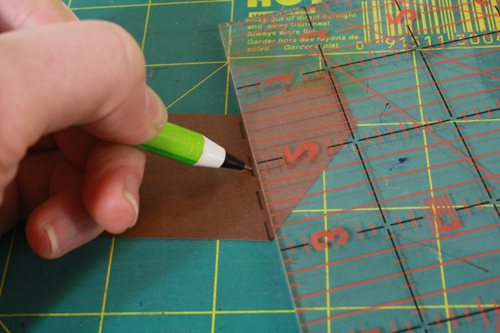 10) Take the angled piece and use a straight edge and the tip of your mechanical pencil (without any lead showing), to score along the dotted lines, making them easier to fold. 11) Now fold the sides of the piece inward. 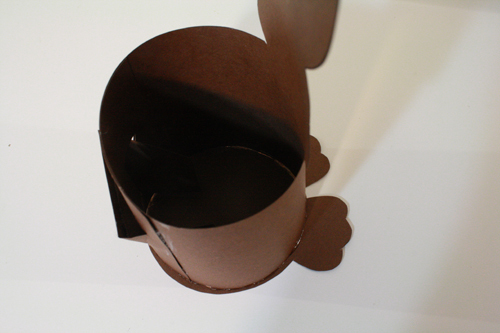 Notice that now the middle of this piece is the same shape as the flap on the back of the bunny. 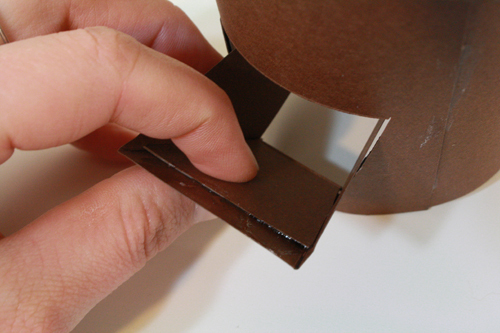 12) Glue the angled piece to the outside of the flap on the back of the bunny, sticking the sides of the angled piece into the bunny on either side of the flap’s opening. You should now have a little drawer-like opening, like the spouts on boxes of salt, or a coal chute, or a mailbox opening. Or in this case, a bum flap. 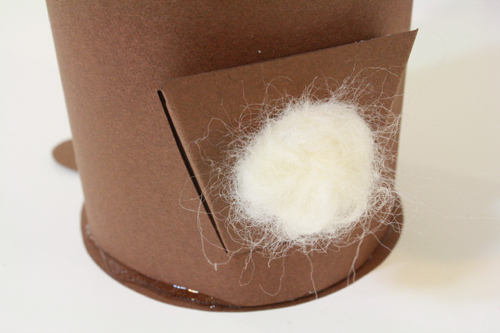 13) Glue a pom pom or cotton ball or some other white fuzzy bit to the back of the bum flap. I used a wad of very loosely needle felted wool. 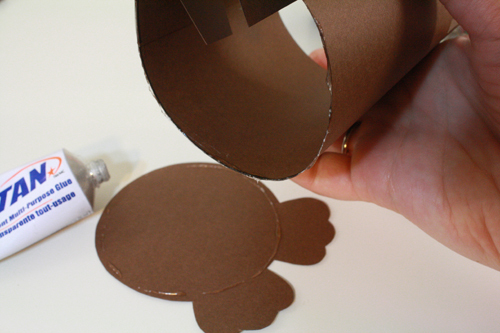 14) Apply glue to the very bottom edge of the bunny, and set down on top of the paper circle with the feet. Allow to dry thoroughly. ahahahah! I read this post aloud to my boyfriend and we both laughed. Very well written. 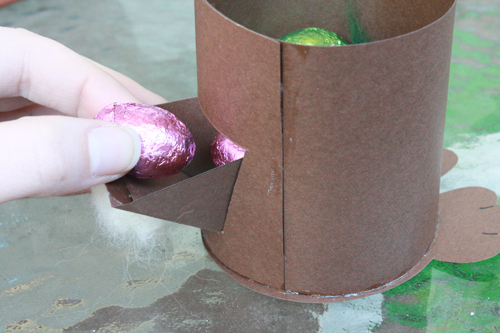 It may be Easter Sunday, but I’m grabbing some paper and tools to make a bunny to dispense my chocolate for the rest of the day. Thanks Tally! You mean you have never seen a bunny do a binky, or throw stuff around in an attempt to rearrange its surroundings to its liking?